It's all about sports!! » Blog Archive » 10 reasons why Formula One 2010 should be a blast! 10 reasons why Formula One 2010 should be a blast! The return of Michael Schumacher. You either hate the guy or you love him, but both fans and enemies probably agree on one thing: the return of Schumacher is a blessing for Formula One as the sport was lacking sufficient charismatic personalities. Schumacher is clearly a winner, being often seen as the bad guy given his controversial behavior; but don’t we have enough dull and programmed drivers in F1? Schumacher should bring the umpf factor back into the sports. It remains to be seen how he will do after 3 years having been away from racing, particularly given the changes since he left. But it usually doesn’t take long for true champions to get back to basics. New rules allow for more spectacular racing. A couple of new rules are being introduced, which may lead to more spectacular racing. The main ones are the following: firstly, refueling is no longer allowed. As a result bigger tanks are needed and more emphasis will be put on fuel consumption and tyre wear. As a result pit-stops will last less than 3 seconds, whilst drivers who can adjust the most easily to changing conditions are likely to have an advantage. Strategy (early pit-stop may pay but will it be at the expense of tyre wear-out) might become even more important and no doubt there will be mistakes in the beginning of the season. Those teams that will come quickest to grips with the new rules and strategies, will be winners. Secondly there will be a new points system. Rather than the old 10-8-6-5-4-3-2-1 points system for the first 8 finishers the 2010 (25-18-15-12-10-8-6-4-2-1) points system will reward the top 10 finishers. This clearly is putting more emphasis on victory and hence the fight for the number one spot could be fierce. Finally, the top 10 qualifiers have to start on the tyres on which they set their qualifying time, aiding of course the bunch following the top 10. Tight competition at the front end of the grid. At the final testing day at Catalunya, it became clear that the differences between the top teams are minimal. In contrast to last year, when Brawn and Co. only showed their tail to the competition, it now seems incredibly close. Last year’s front runners Brawn (now Mercedes) and Red Bull are now joined by the ones who you would expect; it’s good to see Ferrari and McLaren back at the front again, it just gives that extra bite! But that’s not all! The second bunch within the field consists of Williams, Force India, Renault, Sauber and Toro Rosso and testing proved they are not far behind! Which driver will cope best with the new rules? 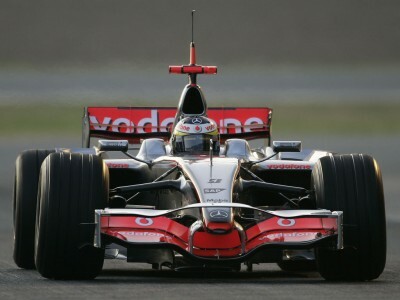 The 2010 season will have one of the best line-ups of star drivers in grand prix history. It will be tremendously exciting to see them fight for the championship. Note that there are 4 former world champions in the field: Schumacher, Hamilton, Alonso and Button. Adding Sebastian Vettel and you probably end up with the big favorites for the 2010 title. Alonso has great racing qualities and is probably best in nursing his car in all conditions, which given the rule changes will be very important. Having said so, his Ferrari is said to be high on fuel consumption, which could run against him. No doubt Michael Schumacher could win races again in 2010. Although he is super determined, it remains to be seen whether he will be able to grab the title after having been absent for 3 years. Lewis Hamilton is the big favorite in my opinion. The guy has matured, has shown he is a great and gutsy racing driver and in essence should be better than Jenson Button. And then there is the dark horse Sebastian Vettel. Could he do it? 2010 might still be too early for him, whilst he also might be pre-occupied with Michael Schumacher in the fight for best German racing driver. And what do the bookies say? The latest odds: Alonso 11/4, Hamilton 7/2, Vettel 4/1, Schumacher 4/1 and Button 10/1. Personality clashes and in-team fights. Feuds and personality clashes in F1 have been of all times. 2010 will be no different and there is plenty to look forward to. The in-team fights will be fascinating. No doubt Schumacher will blow away Nico Rosberg. Schumacher will do anything (and we know what that means) to avoid losing against his teammate with the risk of people saying he is over the hill. That will not happen! The fight between Ferrari’s Alonso and Massa will be interesting too; Alonso is desperate to get back into a championship-contending car and is potentially one of the best drivers in the field. However, he is new to Ferrari, whereas Massa is not. Moreover Massa will be eager to prove he has fully recovered from last year’s accident and can get back to old form. Undoubtedly the most interesting team relationship to watch will be that of Lewis Hamilton and Jenson Button. Button has taken up the gauntlet by moving to McLaren. However, trying to prove he is the best British driver won’t be easy There is no doubt about his pace and coolness, but will he be able to deal with adapting to constantly changing conditions? It will be a clash between two driving styles; Hamilton’s bold and aggressive driving vs Button’s conservative style of racing. Let’s see who will win and who will be able to maintain his personality best. And those are just the in-team fights! There is plenty more of touchy issues. The young Vettel fighting old dog Schumacher for German hegonomy, Schumacher fighting his old friends at Ferrari, Schumacher continuing his feud vs McLaren etc etc. One thing is for sure: it’s gonna be fun to watch! Large number of new teams. In contrast to what was expected (we had a financial crisis to deal with and 3 manufacturers withdrew from F1), the grid is counting 4 more cars rather than diminishing by 6. This means we will start this weekend with 24 drivers. It could even have been 26, were it not that US F1 did fail to be ready in time. So which are the new names? First of all Lotus, which seems to have a very reliable car, that has been clocking mile after mile during testing. No doubt racing fans will be happy to see the traditional yellow and green colours back on the roster. Moreover, Lotus has a good line-up with Trulli and Kovalainen. Richard Branson’s Virgin is a second new kid on the block, but later more on this one. Finally Hispania (Campos) is the last name that has made it. It remains to be seen, whether they will still be there during the last race as the team is said to have financial problems. Moreover the team will arrive in Bahrain without any pre-season testing. Hence its race pace remains a mystery. My bet is the tough gets tougher. And then there is Richard Branson with his “Virgins” No doubt the golden guy with the Midas touch will bring some extra glamour to F1, leveraging his Virgin brand now to car racing. If there is one guy who can do it, it is probably him. Branson has the smallest budget (only GBP40m) of the new teams, but no doubt he will get his fair bit of exposure by doing things differently, you have to give the guy the credits for it. His first bold move has been to design a car by Computational Fluid Dynamics, meaning the car is entirely designed by computer simulation rather than using a scale model in wind tunnels. Of course the car has to prove itself, but if it works, it will bring down costs tremendously. No doubt we will hear a lot more from Branson and his “Virgins” (as he calls his cars). He has done the trick before with his other businesses but F1 will be the ultimate test. Many rookies likely to provide for some interesting action. During the last few seasons we have not seen as many rookies as this year, clearly the result of several new teams on the grid. In total the start of the 2010 season will count 5 rookies: Nico Hulkenberg, Vitaly Perov, Lucas di Grassi, Bruno Senna, Karun Chandhok. But to be fair, Jaime Alguersuari and Kamui Kobayashi have barely any F1 experience either. Clearly these drivers can all drive a F1 car but the lack of experience in driving such a car for an entire race and being in competition with some very seasoned veterans might provide for some interesting viewing. Will Korea be ready in time? The F1 calendar is counting 19 Grand Prix and includes one new venue; Yeongam in Korea. The problem is that the track has not been finished yet and although there is still half a year left, it remains to be seen whether the Koreans will be able to win this race against the clock. We are positive they will. Politics, economics and rules….. And then there are always the arguments in the all-important periphery of the F1. No doubt there will be disagreements between teams on the interpretation of the rules, no doubt Berny will pull a few tricks out of his sleeve and no doubt the FOTA (F1 Team Association) and FIA (International Automobile Federation) will have their ongoing disputes. It will be interesting to see how the balance of power will change within the FOTA now that 3 large car manufacturers have disappeared and are replaced by several smaller teams. Finally, economics will play an important role again. Will F1 be able to find its way up again, will it be able to put constraints on budgets, will all teams survive this year? In any case, if races are not interesting, there is plenty of going on outside the racing track!